Valentine’s Day is about a week away and it’s a huge night for dining out in Lagos. If you think you’re going to dodge the inevitable overpriced set menus, you must be new here.Eat.Drink.Lagos is for the people so we are here to guide you through the minefield of cheesy messaging and price-fixe dinners. This guide is designed for the lads in the house because I know this is the one period you all visit this site. 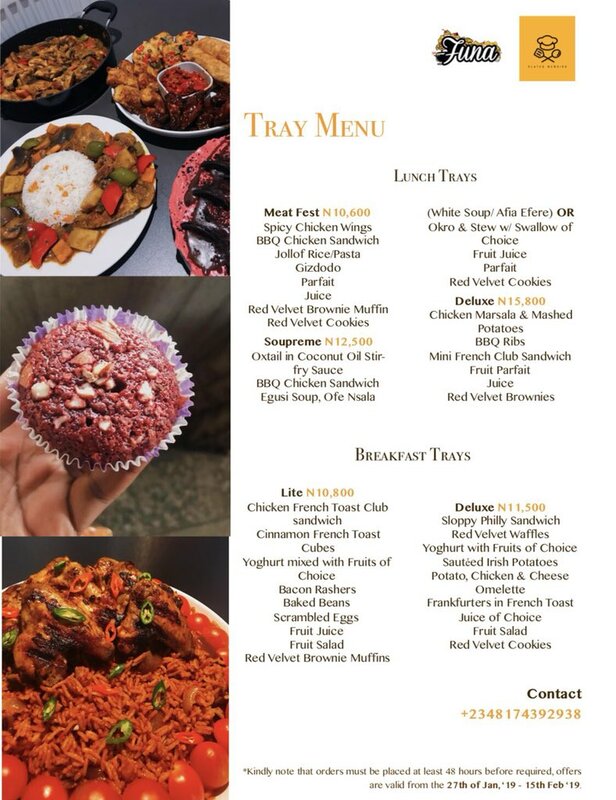 Delis - 1291 Akin Adesola St, Victoria Island. Because I grocery shop at Deli’s a lot, I’ve used these guys before. 10/10. Would recommend. They close at 6:00pm. Aralia by Nature is another flower shop that I’ve heard very good things about. They close at 6:30pm if you considering a run at COB. Honey’s Cupcakes is one of my favourite bakers in Lagos and she’s a definite go-to if you want something beyond the standard “cake and cupcake” most bakers in Lagos do. For Valentine’s Day, she has special collection for the month only. I’ve only had it twice but Cookie Lab is already my favourite cookie in Lagos. For starters, they’re soft cookies and not those hard things every other baker seems to make. That’s “biskeet” not a cookie, please. ALSO: Tomorrow is the last day to order. Never had her stuff before, but Ronke, of The Sweet Spot, says she’s really good and bakers are definitely subject matter experts on baking things. For Valentine’s Day, she’s making 2-inch heart-shaped loaves for N4000. Vanilla Bakehouse went on hiatus for the longest time, but they’re back just in time for Valentine’s Day. Praise be. If a work lunch is more your speed, Plated Memoirs and Funa are collaborating on a special Valentine’s Day menu. There’s also more expansive breakfast and lunch trays, which come with roses and champagne if you ask nicely. 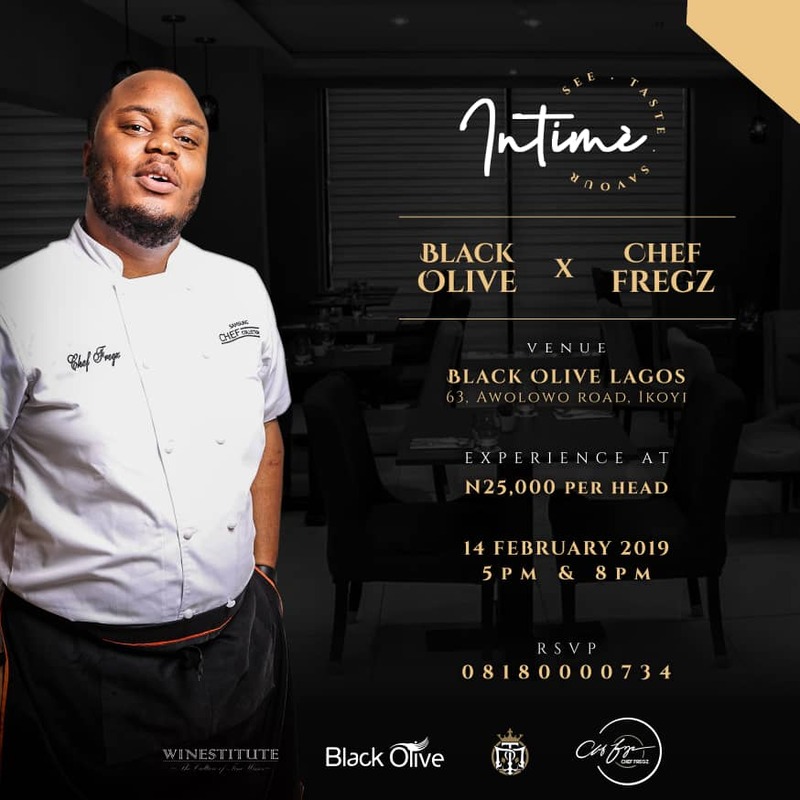 This year, Chef Fregz will be at Black Olive in Ikoyi with a 4-course dinner with complimentary wine from Winestitute & Bloem. There’ll be two seatings: 5pm, for the lads who skip work early, and 8pm. For one night only, Chef Imoteda of Heels in the Kitchen will be taking over the kitchen at SABOR. Her 5-course dinner has Suya Onion Jam in there. La Taverna is one of my favourite places in Lagos and for Valentine’s Day, they have probably the most affordable of the prix-fixe menus. The flyer isn’t the greatest, but she’s really excellent in the kitchen. We got invited for a dinner at Miele one time and she was cooking. It was so so good. But yes, the flyer is a disaster. One of the most consistent restaurants in Lagos. You’ll pay a pretty penny, but it’ll be very worth it.